Fourth Row Center: Film Writings by Jason Bailey: In Theaters: "Attack the Block"
American distributors Screen Gems have reportedly engaged in much hand-wringing over the characters’ thick regional dialects (gauging audience reaction and comprehension may very well be why they had so many preview screenings this summer). It must be said that some of the dialogue really is tough to make out—but it’s not really a distraction. We may not always get all of the words, but we get the music (if you will), and the picture has a crackling, pounding energy that doesn’t give us much opportunity to worry about the occasional half-comprehended throwaway line. Cornish navigates a tricky tone, mostly successfully; Attack the Block is basically comedic in nature, but it has real scares (the gags are blunt and effective), and real bloodshed. The graphic violence occasionally threatens to overwhelm the humor, but Cornish usually stops just short of overkill. Most of the humor—aside from the stoner jokes, which are easy but serviceable—is borne out of the contrast between the decidedly extraordinary situation and the characters’ practical, relatable reactions to it. They’re scared out of their wits, but after lifetimes spent with alien-related films and video games, their in awe when experiencing the real thing (“I’m shittin’ myself, but at the same time… this is sick”); they’re trying to save their lives and save their block, but also wrestling with the limitations of, say, pre-paid cell phones (“This is too much madness for one text!”). In that tension between science fiction and earthbound humor, Cornish’s script is tilling from the same rich, fertile soil as Ghostbusters—a film that more than one review has compared this one too. 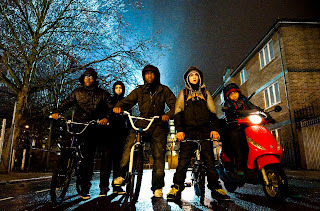 But that similarity also highlights Attack the Block’s primary weakness: that it is hard to discern much in the way of distinctive personalities among the characterizations and performances of the gang. Pressed to explain the differences between Dennis and Jermome and Pest and Biggz, this viewer would be utterly without comment—which would never happen with Venkman, Stantz, Egon, and Winston. The sole exception is Moses, who gets the film’s strongest character arc, required to step up and transforming in the process to something like a thug John McClane. The film’s action beats are uniformly well-executed, but his slo-mo takedown of an apartment full of aliens is an absolute crowd pleaser. Whittaker is nicely matched with him—and the way the script teams her with her muggers, out of sheer necessity, is slyly clever. The funniest performance in the movie, of course, is Nick Frost’s, though he has less screen time than you might expect (or hope for). Cornish is a talented filmmaker; his camerawork is zippy and his lighting choices are moody and effective (you can’t beat those rolling hallway florescents). 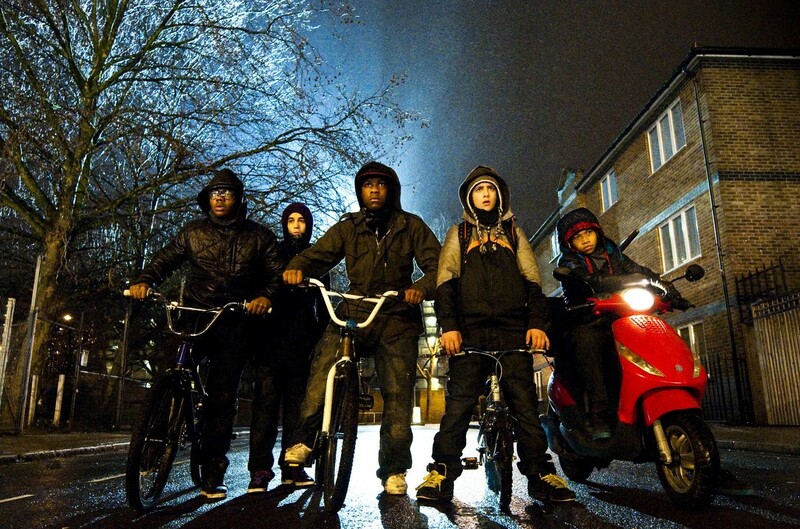 Attack the Block has some laughs, some scares, and some rousing moments; it’s a good time at the movies. Just don’t let your expectations get out of control. "Attack the Block" opens tomorrow in limited release.